I now have 3 weeks worth (well, almost...still adding some math centers for 3rd week because I'm not sure exactly how far along we will be with our adding and subtracting). I discovered that it takes me just as much time or a tiny bit more to plan for 3 weeks than it does to plan for 1. I can't even tell you how good it feels to be so "prepared". A little photocopying in the a.m. and a bit of laminating tonight and my next 2 Sundays are free of math and literacy basket work planning. Woo hoo! If you click on either lesson plans, it will take you to the Google doc which has clickable links. If you want more information than I give, then you can click on the cover page of where I got each center from and it should take you there! If you have followed me for awhile, you know how I set up centers. If not, click here or here to get more information.. After many years of trying different methods, I finally found the EASIEST, MoST EFFECTIVE way to implement centers and create independent learners. But the basis of it is that each of 4 groups starts out center time with their must do work (which is what is pictured in both of my visual plans). Staple centers are the best which is why I have created all sorts of things for my classroom that can continuously be replenished in basket work stations. This is why my students are so independent during these times of the day--because they've "done it before" in some shape of form. You just make it a little more difficult each time. Guided Drawing With a Literacy Component: I chose K is for Kite for the students to do step by step drawings of kites and then read and copy a sentence at their level. K is the focus letter (denoted by our reading program). Stamping Center: We are working on vowels and "slithering" through words, so the students will be using the x stamp to cross out the picture that doesn't have the same medial sound as the other two words. Poking Pinning With an Added Touch: So excited about this...just couldn't do away with pokey pinning, although most of my students are ready to move on. So what does a good teacher do when their students love doing something, but it has become "too easy"? Amp it up! The students will pin their picture and then respond to a prompt that goes along with the picture they've pinned. Can't wait to see how they like it tomorrow! I Spy Signs of Spring (from A Differentiated Kindergarten-go to google doc by clicking pic below to find link): Students will search for, read and record CVC words. Love these and so do my students! Kindergarten Math Stamping: Students will be counting ten frames to get teen numbers and stamp them. Eggcellent Secret Code Words (from Sharing Kindergarten-go to google doc by clicking pic above to find link). A great way to incoporate both numbers AND sight words...she provides ones already completed OR you can come up with your own words with her blank page like I did! Number Fluency: My students are loving "racing with themselves" to improve their letter formation, number sense, and ordering. I have been doing it every morning, but have decided to move it to center time so the kiddos can have more time to complete their work. Crazy Rabbit I Spy Addition Center(from A Differentiated Kindergarten-go to google doc by clicking pic below to find link): Students will be finding addition facts hidden in pictures and solving them using a strategy that works for them. We will also be following up on The Legend of the Shrinking Hats this week because my students are going to be super excited to find the styrofoam hats they designed last week shrunken "to the wee size of a leprechaun's head". 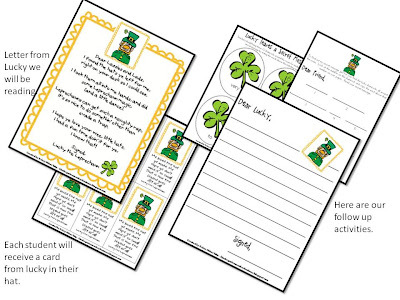 They will go on a hunt around the room to find a message that Lucky left just for them, as well as write a letter to Lucky, whether it is to thank him or question him is up to them! 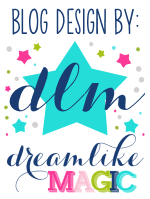 And a new freebie (in my visual plans for next week!). I hope you can use it in your classroom in the upcoming weeks as we head into spring and Easter season! I linked up to Manic Monday Classroom Freebies. You should put it in your phone as a reminder to check it out every Monday so you can grab tons of awesome freebies for your classroom! I am so excited to do The Legend of the Shrinking Hats next year. This is really the first year that I have spent so much time on St. Patrick's Day. My students loved having the Leprechaun visit. Thanks for your resources and ideas. Love the easy steps for drawings chicks. After Spring Break, we do a chicken unit and this will be perfect. Thanks so much for sharing! I have Monday morning duty too! It is nice to get it done early in the week but hard when I have the week to get ready for!